William Lee who joined the Royal Engineers in St Helens having been unable to join the Liverpool Scottish Regiment. William Lee was the son of Frank and Emma Lee. He had one brother, Albert who enlisted in the South Lancashire Regiment and two sisters, Emma and Betsy. He was born in 1887 and lived in Station Street, Rainhill (where the dry cleaners now stands). In the 1911 Census he is listed as a bricklayer. As a youngster he was a very keen sportsman playing cricket and football until he sustained an injury to one of his kidneys. He and a group of his friends went to Liverpool to enlist in the Liverpool Scottish Regiment. He was unable to do so as he had no Scottish blood relations. 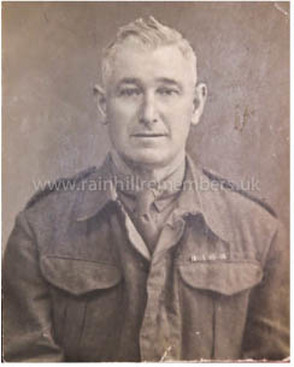 He then went to St Helens and enlisted into the Royal Engineers. He fought at Ypres and Albert and Arras before being gassed in the trenches. He returned home to Blackpool to convalesce and remembered people throwing food and gifts to him and his comrades on the train journey. Later he married his wife, Pheda in Anglesey and returned to live at 20, Victoria Terrace. William, always known as Billy worked as a brick layer for Geoff Lowe. Billy is the father of Noel Lee and the late Joan Critchley. William Lee lived in Station Street, Rainhill. This is the street running directly from Rainhill Station to Warrington Road. 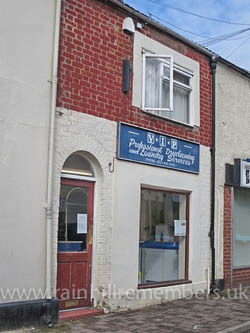 The house that he lived is a Dry Cleaners Shop in 2015.